We love shooting in the Village of Lewiston in Lewiston, NY. 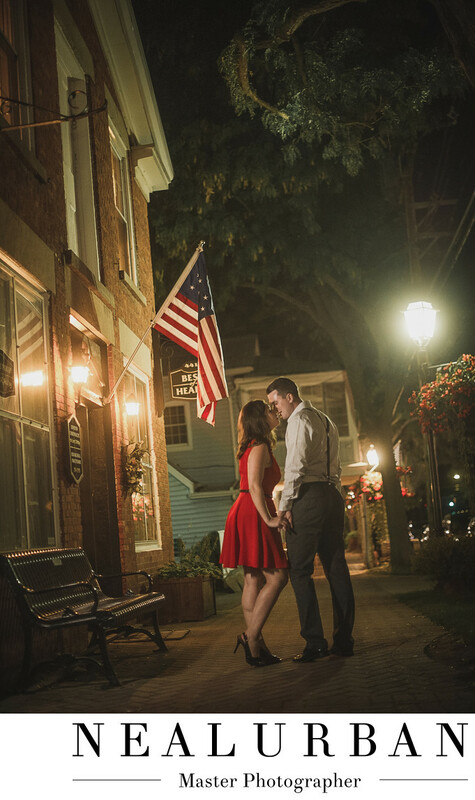 We went there for Ashley and Dan's engagement session. They told us the style they were going for and we threw out Fort Niagara State Park and village of Lewiston. We started the session at the park. We worked in nature and even photos along Lake Ontario. We did more casual style outfits there. Then they got into their dressy outfits and headed to Lewiston. It was only about ten minutes away from the park in Youngstown. I can't get over how great the bride and groom to be look. They had the perfect outfits for this location. We love red. It is such a bold color. I think it makes such a statement. Dan looks amazing with his dress pants and suspenders. We had them casually walking away from the camera holding hands. We told them to stop and have a kiss. Dan pulled in Ashley for this amazing kiss! We love the American Flag in this image too. Everything looks so old fashioned in this image. Center Street in Lewiston is not very long, so we just walked around and waited for the street lights and store front lights to go on. Genuine smiles and laughter make for the best photos. Once the couple gets comfortable with us, they should feel like we have known them forever. That is always the relationship we want with all of our clients. We know this may not always be the case, but in Ashley and Dan's case, within the first ten minutes everyone was comfortable! Location: Center St. Lewiston NY 14092 United States.